UserTesting’s Human Insight Platform enables companies to see, hear and talk to their customers as they engage with products, apps and messaging. Half of the world’s top 100 brands partner with UserTesting to make more informed decisions based on customer feedback. "Fast, convenient, no more excuses to not test! " "Great way to check out new products and get paid for reviewing them! " What User Research solution do you use? "UserTesting - Test on end users"
Usertesting is a very important tool, for all types of developers and designers, this application or website, offers many options, so that different users from all over, can test the applications, which are uploaded to this platform, something that I really like this website, I can really know before launching an application to the public, the thought of real people about them, in our institution is something very important, since we teach our young people since they were very young, the foundations of programming, and when they can already make applications or websites, with different characteristics, we upload them to usertesting, so that they can see, what other people think about the use of their applications, and how innovative they can be. become, where they are failing, and what the people of the community think about them, this becomes a way to self-evaluate, all kinds of web development projects. Some of the reviews about our applications, it is difficult to know if any user, made a correct proverb about it, and later made his comment about it, sometimes you find revisions, of people, which is very clear, not even They took a couple of minutes to see what the application was about, and they just make a simple video, commenting on anything, which clearly does not help us at all, it is not in all cases, but it is something that usually happens. It is a fantastic tool, to perform all kinds of tests on applications and websites, with real people, without counting physical study expenses, which usually cost very much. Gracie to this application, we can make different revisions to applications, which create our students, many of these applications are very innovative, there are guys with an incredible talent from an early age, to develop all kinds of software, their ideas advance much faster, than adults, and have the opportunity to other people, make a real test of these applications is fantastic, because in this way they are failures, which can happen with the daily use of these applications. "There wasn’t an option for 11." I can’t imagine I’m alone in scoring your products & teams at a 10. UserTesting is committed to continual improvement and innovation in all areas of user research. I regularly see existing products being enhanced and improved while your teams deliver updates on how to get the most from those products. Combined with new features being released, the range of options available for researchers is amazing. Gathering participants, conducting moderated or unmoderated studies, and the post-study tools for review and analysis make it easy to learn about our guests’ relationship with our products. Our teams’ efficiency in collecting information and the depth of that information are a tremendous benefit. Our interactions with the teams at UserTesting are always outstanding. They provide great insights on best practices, listen to and appreciate our ideas and feedback, and provide stellar service when our team needs extra help. This is how we approach customer service and it’s refreshing to receive that same treatment. In short, you’re got great people building great products. UserTesting is an essential tool for our team and helps us provide essential information to our business. Our team has had difficulty getting some prototyping tools to play nice with the usertesting.com services, but I honestly don't know enough about the underlying technologies to know where the source of the issue lies. I will say their support team has been great in helping find ways to move past any of the issues we have had in the past. The ability to get quick feedback from a wide range or specifically targeted group of users and immediately pass both data and user videos to stakeholders is huge for our team. Usertesting.com is a great addition to any company's existing user research strategy. It's become an essential part of ours. Brand and product perception, product/feature functionality preferences, process pain points, comprehension around messaging, product placement & visibility, business alignment with customer's mental model, qualitative feedback on city and/or region representation, general areas of improvement. The benefits we've seen are the customer insights into the areas mentioned above. We've been able to maintain a series of benchmark studies comparing our brand and digital products to those of our competitors to gauge the effectiveness of our work. User research during the early stages of product development has lead to changes in business rules, communication strategies, and eventually finding a balance between the needs of our customers and our business. "Best-in-class software that is easy to use"
Unlimited user tests make it so much cleaner and faster to test everything in a design. Not just a couple of things that we were unsure about. I really liked the templated tests that were available as well, this was key in helping me set up a couple of prototype tests that I had never done before. It really helps to walk you through the process. I really like being able to get a rating when I'm asking a user a question now as well. This is helpful and quick for me to analyze results. I can quickly see if there is a problem with one of my questions or how easy/hard it was to complete a task before I even watch the videos. I love that if I see that a majority of users didn't go through a task as expected, I can quickly watch every video of that one task and act on that quicker than spending an entire day analyzing an annotating videos. The transcripts is an amazing add-on as well. Sometimes if the users talk really low or mumble you don't get great information but it is super helpful to be able to go through the transcript and pick out clips that may be interesting to stakeholders. This is definitely best-in-class software, and it is easy to use, even for someone who doesn't have a lot of experience with user testing. It gives you instructions and guides you into being successful. Onboarding/contracts. This was one of the harder ones I've been through. The pricing tiers changed fairly recently so I think there is still a lot of back and forth until the team gets a routine down. There were times where my rep wasn't answering calls/emails or just gave very broad information. Hopefully, they are working on cleaning up this process. Honestly, it is the only reason why I'm giving them an 9 instead of a 10 because this process was awful. Leave yourself a lot of time for contract negotiations, and getting it set up with your purchasing department (if you work for a large organization). Also - determine what your governance of the product will look like. If you only have 1 seat, only that one person will be able to launch tests for everyone added to the account - so make sure that person is reliable and it is part of their job description. Also - the contract can get very expensive if you are only using it for a few tests a year. I would recommend ramping up the amount of testing that you do or bring in other units within your organization to take part of the contract. I've really been enjoying usertesting for my competitor research. This is something I wouldn't have typically done all the time with usertesting, and used to only send a couple users to maybe a main competitors website. With unlimited videos, and rating scales I can quickly see how users perform similar tasks across many different websites. This information has been extremely useful for our UX and design teams. "Popular for a reason, still needs some tweaks though"
Turnaround time! Panel size, robust demo selection, balanced comparison, nice interface for the most part, helpful built-in suggestions, test plan sharing option, ability to export a spreadsheet of all related info (incl. transcription) for a study. Highlight reel. Tagging. Customer service is great, too. Really too many things to list here. While my cons response is longer, definitely more pros than cons. No branching logic(!!) or max. diff. stuff built-in. Text formatting is a pain, especially when you have to share your test plan by sending to yourself first to clean the tags up. I've seen better transcription accuracy a lot of places; and if it's a webcam study, don't even bother to look at the transcription. Highlight reel composition should allow transition visuals (e.g. section title/explanation) and an option to export as one video. No way to cancel scheduled tests. Lastly, they've changed their plans drastically twice over the last 2-3 years, which is concerning. I've seen what comparable services have to offer before, and this really does seem to be the best value out there. Rapid qualitative testing. The capabilities they provide help me conduct and turnaround one or more qualitative studies at a time in 5 business days fairly consistently. That's something. Once you've created your assets and determined what exactly you're looking to test, UserTesting makes it incredibly fast to setup and get results the same day. Essentially it's like this... Got content/assets/stimuli (check), Got your research question/hypothesis (check). Go through the flow and set up your screeners, questions (1 hour to 1.5 hours if you did your homework). Sit back, get results (1-3 hours depending on your screener). Yeah... so boss needs "insights". No problem get them the same day without a budget. I dislike they're new pricing model. It makes it so only one person and a select few of folks in your company can make and launch tests. I miss the old schedule were any old scrub could brandish a test and seek approval from the test master. Want insights fast, low-cost and easy to set up? UserTesting is for you. Everyone needs insights... UserTesting helps us get there fast. I use it for product utilisation, messaging fit, customer understanding and much more. its amazing to me how usertesting.com is able to find very specific user groups, based on a set of screening questions. I've used it for several enterprise and b2b websites with very unique users, and have been able to get results within a matter of hours or a day at the longest. usertesting.com could use a bit more tools around documenting and sharing the results of the user tests - a sort of test write-up functionality. Currently I use other tools to do this, it would be nice to have it right in there next to the test. I'm using usertesting.com to identify issues on the website with usability and comprehension, with the goal of driving improvements to our site. We have benefited from the low cost, and from the improvements we are able to drive. "UserTesting.com has given our design team time and confidence"
The quality of the tests we run is astonishing. No matter how niche we screen, the participants UserTesting finds us are intelligent, thoughtful, prepped and always give the most thorough, valuable responses. Sometimes it's difficult to predict when a screener will take a long time to fulfill, and you might not get responses for weeks. It would be good if, while writing the screener, UserTesting were able to give a live estimate of time, even if not accurate. I have always used user testing as a UX tool for designing good solutions, however since working with UserTesting.com, now we more often use it to prove or disprove an assumption, or question something we're not sure about in a design process. Being able to throw up a test overnight and have results in the morning has helped us be lean and move faster through design processes. While I’ve used UserTesting.com for typical interaction tests, my favorite feature is recruiting via User Testing and then using their partnership with Optimalworkshop.com for card sorts and surveys - including Likert 5 and 7 point scales to measure those hard to quantify elements like perception and intent - those often asked questions internally that are impossible to answer with engagement/click analytics or the typically small sample sizes used for standard prototype testing. We now know what are guests expect & hope for and the proper format for delivering it. Optimalworkshop.com requires a separate license. What do guests want, & how would they consume it are typical internal debates - UserTesting enables us to determine the proper messaging, content, organization and hierarchy of information. "Useful tool for a small UX team"
UserTesting is a great tool for running quick remote usability tests. You can set up a test and run 5-6 users within an hour, which is obviously way faster than running in person moderated tests. Their UI (both for setting up tests and for reviewing videos) is well set up and easy to use, and they have a large and varied group of testers, even in Canada (where I am). I've also found their support team to be friendly and responsive. This is likely true of all remote unmoderated user testing, but it is hard to give your users enough information to stay on task and not get lost without biasing how they interact. It's easy for users to get lost in the test, and it takes time and experience to learn some task writing and structuring techniques to help with this. UserTesting doesn't provide any materials to help test writers with this, which is too bad. We're a small UX team handling a large product. UserTesting is a great tool to be able to test more aspects of our product than we would be able to if we relied on moderated and/or in person testing alone. "Would recommend to anyone who wants to build great products"
I like how easy it is to use. I also love the customer service chat tool. i am always given quick response and helpful feedback. I think the screen from screener to the questions can get a little confusing so it would be nice to streamline that. I also think it would be nice to be able to start testing from the first screen b/c a lot of the time you are just iterating screeners and don' t have to go all the way through. Finding out if what we are building is useful. We do testing for creative, marketing and ecommerce. We have realized the benefit of not wasting money on development of one off ideas. "Proof Hypothesis and get things done faster using User Testing "
I like being able to take notes while I listen to the users. and Highlight reels! those are the best for meetings and getting people on board with changes. We also have been able to improve our Copy and communication towards our users. Setting up the target audience can be a bit overwhelming and it would be nice to have saved presets. at the end at least for me we are testing almost the same niche all the time. test the questions at least once (can be not in user testing) to make sure people understand what you are trying to find out. Sometimes what it seems obvious for us might not for all. "A quick way to get user feedback"
UserTesting has a large user base that matches a variety of recruiting criteria, so I'm able to get results on my test very quickly. All test takers can be rated based on their performance, which ensures high quality of feedback. 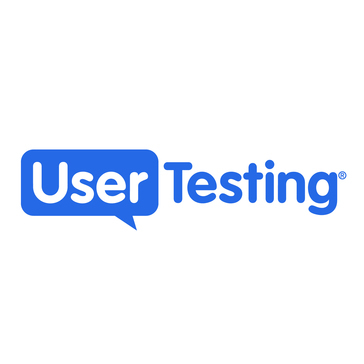 If something doesn't go as planned with the test, UserTesting customer service has been very responsive and helped me resolve issues within couple hours. I wish there was a way to automatically transcribe verbal user comments. It's a little hard to search videos for specific information or a user quote. It will also be helpful to have question formats that allow the user to compare two images side by side or rank answers in a question based on preference. Also, the open to save a test while it's being created is hard to find on the page. It's a quick and guaranteed way to get user feedback on a website or a prototype. I've been able to validate design concepts quickly and iterate on them based on the feedback I received form the users. This translates into huge saving for our company because we don't have to spend development hours in order to get the product in front of our users. By doing user testing, we can move through the design process a lot quicker and ensure a successful launch. "Excellent tool to scale UX Research across a team with limited resources"
As one of two full-time researchers on the UX team at my organization, I like that I can step my design peers (and others) through the really simple platform, and with some guidance on best practices get them experimenting and testing out their designs quickly. It's been really helpful to offer this tool as a means to get answers in an Agile setting. The team at UserTesting is constantly reaching out and improving the platform, I can't think of anything I dislike at the moment. Initially I had a problem with the 15 participant max on the panel, but it hasn't been an issue. In the few cases where I need a broader data set, I duplicate tests and run multiple rounds. My company had considered similar platforms in the past, we made the choice to go with UserTesting based on a proof of concept trial. The team was very supportive of this, we also ran one when they were rolling out the Live Conversation feature. I recommend doing a POC to see if it suits your organization's needs. The UserTesting platform has helped us quickly shape new features, revise workflows and get answers on preferences to deliver the best experiences. The best part about this – aside from getting an answer much faster than could be agreed on in any meeting where everyone feels strongly that they have the better solution– is that when an answer is found, there's no personal stake in the game. If it turns out the design doesn't perform well, you go back to the data, review it, try something else and test it again. It allows for a much healthier cross-functional team dynamic and keeps teams more productive by staying focused on the business goals. "Usertesting is our tool for quick unmoderated testing on a daily basis"
Testing on prototypes allowed us to kill ideas fast - before they get developed and launched. Getting to hear real customer's voice - is very powerful to anyone at any level in the organization. Analytics gives us the "what" and "how many/much". UT helps us understand "why". Running competitor comparison analysis provides insightful information. "Great Platform for Remote Testing"
The tool keeps improving to meet our needs. With the addition of Live Conversations and other features and the quick responses from the UserTesting team, this product is becoming invaluable to our UX Research effort. Sometimes it takes a long time to fill surveys when we don't think our criteria is too narrow. We were unaware of some of the default settings and had to have them changed in order to improve our recruiting. Wish there was branching logic for screeners and the ability to randomize task order or combine multiple studies to accomplish this. This platform makes it really easy to get feedback quickly. There are product limitations, such as the inability to copy a study that was designed for a prototype to a study of a website (which you might want as the design is maturing). Remote testing, testing competitive products. "Expensive but worth every penny in getting your team to buy-in." The ability to connect with Users around the world, and get their mostly honest opinions. I like how I can make highlight clips and share with people in my organization who don't use this product. To get started I think their templates are great. Setting up the test can be time-consuming, you also have to dive a bit more into Stat's to get good test results. In order to make sure your test is not biased in any way. I would like a way to preview my test internally with a co-worker, to make sure that it makes sense before I send out a test to a real user. People are aware that they are being paid to review your product so most users will not be as harsh or honest about how they think of feel about a product, so making sure you ask unbias questions becomes very important. Being able to create categories and questions of our own for repeat use in screener questions. Insight gathering to prove methodologies and road-mapping priorities. "User testing is very helpful for tight deadlines"
In our company, we supplement a lot of our qualitative work with Usertesting, it compliments other methods very nicely and can easily be turned around super quick. Sometimes we struggle with testers lying through screeners and not answering questions honestly, which can be frustrating but it's a learning curve to work through. We ask a lot of our own customers on Usertesting to walk through newly developed screens on our website and app, their feedback is critical to having our own customers talk through their unique experiences and how they would like to use the online platforms. "Easy and fast way to get feedbacks for your digital product"
I can get fast feedback from a specific demographic of users from all over the country. Cost efficient - cheaper than having in-person usability testing. Recorded video of the sessions is great! I can test both mobile and desktop products. Would like to see even more powerful demographic target audience filter. Try it out! You will be hooked. Providing easy to use K12 school, education and parenting resources for all parents in this country. Able to easily reach and get feedback from parents living in various parts of the country. "A great resource for remote user testing!" It is super easy to learn to use and there is a huge user testing panel to utilize for expedited feedback. There is also integration with InVision, which makes it easy to set up prototypes for testing. The price of it can be kind of high, especially the added costs for features such as their new moderated remote user testing feature. Moderated user testing in order to gain qualitative insight into problems that may exist currently with my business' experiences. This has helped with some team disputes, gut checks, and even benchmarking against competitors. "UserTesting has changed the game"
The speed and reach are really hard to beat. I've been more productive with UserTesting than by using classical means of recruitment for research projects. It's allowed myself and my team to rapidly research issues that would've been incredibly difficult or not worth it otherwise. I also appreciate how they regularly improve the platform and listen to their customers. UserTesting can be more difficult to leverage if you're looking for very specialized users or if your prototyping requirements include motion or micro interactions like in Principle. We're trying to increase retention and adoption of our platform by eliminating usability problems and uncovering and product awareness issues. So far we've been able to identify improvements to demonstrably increase some of the core product metrics. Working at a startup it is imperative to get quick responses to ideas and product features. For Ionic, user testing is the way that we get that feedback. It has worked wonders and we are usually able to get the feedback week need within a day. Some tests would be better moderated and whereas this feature exists, it costs a premium. We use user testing as the source of truth when establishing if the feature hits the mark or needs another round of design. The simplicity of the platform. It's easy to set up experiments, choose tasks and see the results. Also, very fast delivery of videos and customer support is top notch. I've found their pricing towards a pro plan a bit unfavorable since there is no real estimation shown - only request a quote. We're seeing how real work within the platform and compare it to how we envisioned the whole process. After only 5 videos, we've found real action points that we're working already on implementing. I like how robust the screener allows me to be. I can easily recruit the exact participants I need for my studies. Normally (unless I have a pretty specific screener) I get results back pretty quickly as well. I've always had a pretty positive experience with the quality of participants as well. The only thing I dislike about Usertesting.com as a company is that I can only run qualitative feedback studies. I would love if they implemented quantitative survey building software and the ability to use their panel to launch quantitative studies. We're solving many business problems. Usertesting.com allows us to test early and often. We can get insights quickly which informs us to either pivot or continue in the same direction we were before. "Great tool for insights, a little expensive"
The pricing is more expensive than similar tools, and the agency pricing isn't too flexible as there didn't seem to be an option for the pro features in a monthly plan / ad-hoc basis, only in an up-front annual plan. 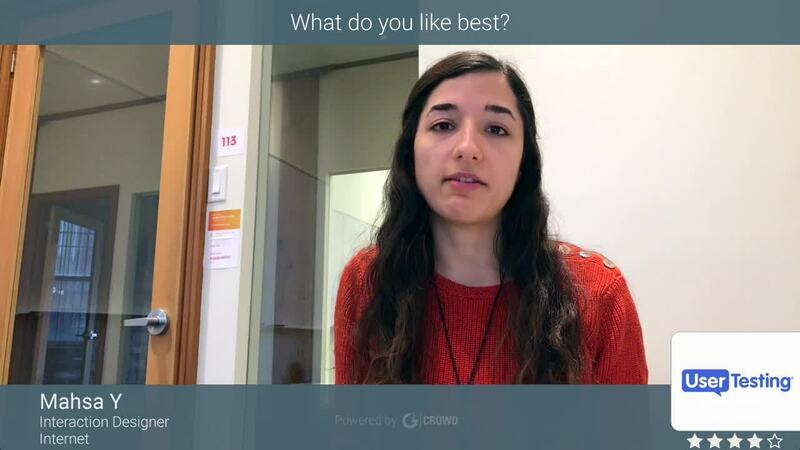 "UserTesting has expanded my UX research capabilities"
The feature that has given my team much more opportunities to gather user insights is the Live Conversation. Being able to set up a moderated test with users is a huge advantage in providing valuable feedback to stakeholders. It would be nice to know more in advance of the changing features to better optimize the tool for what we need. Most of the business problems we are solving is getting design and functionality feedback to streamline our project process and validate existing applications. "Great tool for user testing"
Ease of use for ramping up my design team and getting quick results on prototypes. From research, I believe them to be best of breed in the space. We subscribe to an enterprise program that lets us test as much as we want - not a per user cost - so cost is not a barrier to use for our design/ux team. sometimes, the recruited users seem to be overly positive. But that's a minor issue. testing prototypes before development. design quality. Love the diverse panel UserTesting provides. We often use them in the non-traditional way to conduct un-moderated interviews and often our screeners are very specific, but we're always able to get a panel to take them! The feedback is always super fast! If we launch a test/interview, depending on the screeners, we often get the results the same day! I wish they would allow for more than 15 users per test. Learning customers' or potential customers perspectives on various processes. "The UI is becoming more difficult with each user test "
The tech support is very slow. We couldn't get our build to work, and when their engineers worked on it they ended up breaking the build in such a way that users couldn't run it. The testers are good, but I think some are racing through tests to make more money. The process to run a test is difficult. We are trying to get quick feedback on various features in an app. The usertesting testers are thorough and usually provide detailed feedback that proves helpful in the design process. I think the turn around time from the testing panels and real user feedback are great. Also the Templates provided are a good way to kickstart new ideas that you may not have originally thought of. The hardest thing about this tool is finding the time to review all the content that is created. If you can get around that, you can gain some real insights. Trying to find pitfalls in the user experience of our sites, that gives more feedback than just purely looking at heatmaps and data metrics. Setting up a test on UserTesting is quick, efficient, and has fast results. I love that you can validate an idea in an hour. It definitely empowers product and design teams to have a user-centric process that doesn't overburden the decision and approval process. I dislike the UX around creating a highlight reel as well as the inability to import a email list into MyRecruit and how they have that part of the product set up. Prioritization of on-going usability issues, whether or not a concept resonates with our users or just normal people who are active within our space. UT is always improving what they have. They listen to their customers and try to make their experience as smooth and efficient as possible. Nothing really, if I have a problem with something, I contact them and they will work hard to correct it. This is a great tool to get to know your users and how they feel about your product. Having this type of data to support decisions is very helpful. Usability and creating the best user experience we can possibly have on our site. We've found through user testing has helped us become more aware of what works and what doesn't for the user. "Good for video but otherwise limited"
The speed at which you can recruit participants. The participants are generally well trained how to think aloud but I do wonder if they are 'too well trained' and if they are indicative of normal users. The cost associated with the platform and the lack of quant stats. At a cost of $99 per participant it means we can only test low numbers of users which limits any 'data' that can be relied upon. If you have the budget then give it a try, however, if you want to get data from a large number of users and get value for money then there are other tools which will give you the video, plus more, and cost far less than $99 per user. Helps to test wireframes and prototypes. By asking participants to complete certain tasks we are able to fairly quickly see how easy they have found it and whether we are on the right track. "Usertesting is great for providing valuable feedback!" What I like best about UserTesting is the quick ability to gain a lot of input from various individuals and also providing it through the online site or phone app. The Main business problem being solved is the ability to test your apps and also get quick feedback from various users. It provides a multitude of opinions which is a huge benefit. "Quickest way to gather user insights"
Can't really say there is anything I dislike; it's really such a great tool to use. I think every company can find value in it. Helping stakeholders understand our customers which leads to better product decisions. You can quickly launch tests to large amounts of people and get results back same day! Moderated sessions take us weeks to organize- but with usertesting.com we can get info quickly and put it in action within a project timeframe. Like any system, there are some small improvements to be made in terms of how data is organized and how we allow access to the team but small issues in the big picture. We are able to do testing mid project so that results can be incorporated in final design, without compromising the projects timeline. "UserTesting streamline my development process"
I'm constantly surprised by the our users! I learn so much from them as they go through the sites. The turnaround times for tests are incredible! I wish it were easier to recruit our own member base through the system. Many of our members are older so it is hard to get them to download software onto their computers. We have conducted so much usability testing which leads to better designs. Through UserTesting we learn about task completions, satisfaction levels, whether or not we are meeting expectations, of if our design / workflow makes any sense. "Helpful for quick, quality feedback"
Easy and efficient way to gather helpful feedback about your products. Can use any image, prototype or live designs, can get respondents all within a single day. Respondents are generally good quality. UT is a helpful research input but comes with some caveats since all the respondents have selected to be part of the panel. It's best for studies that don't rely too heavily on a very particular type of user or customer. UT provides a way to test out marketing campaigns, product prototypes, and other designs in such a quick way that it's worth doing before any release to get a temperature check on how people will respond, find usability problems, etc. Ability to create highlight reels with notes! It's great that I can watch the video and note sections with comments and easily create high level versions of these videos to present to my team and also to clients. They get a better sense of how users actually interact with the features, which helps my team and clients build more empathy with users. The price is really expensive compare to other remote user test software. There are some really cool features that we can use, but only at the enterprise level, so that could be a turn off to a lot of folks who want something more affordable. Helps capture real user insights and creates a short video to provide clients to get a better idea of issues or delights users finds on new features. I also love that it helps keep my notes organized by adding them directly to the context of the video. It would be great if it allows better deliverables to present to client as the results in addition to the highlight videos. I appreciate the ease of use of the User Testing platform and responsive staff! The price tag. Not sure our school district will always have budget available for UX platforms. Making school websites and school district websites more user friendly is in the best interest of leadership but in lean budget years it's a tough sell. I work to make the district website and mobile app user friendly. Using this tool has helped me work through beta development to work through pain points for users before taking directly to our families and communities to test. Some people have hacked the system a bit and created multiple accounts I think, so we sometimes get the same person reviewing our product multiple times. It's either that, or the unique user option has a bug. Use UserTesting. You will not be disappointed. And don't get hung up on other products that maybe offer a more robust feature set, but are also more expensive. They are a jack of all trades, master of none, whereas UserTesting does recorded videos of people using your product very well. Getting feedback on existing products, and new features - what do people like/dislike, what works really well, what's confusing, etc. Helps us answer specific product questions and de-risk new features before rolling them out to the public. "Perfect solution for our small team"
First and foremost - the UserTesting.com panel is great! It is easy to get fast feedback from a range of good users. It is also incredibly easy to use the video player to skip to key tasks, to slow down or speed up and make and share video clips and highlight reels. It can be rather confusing to navigate to the information given by users while taking the screeners. There is also a single download format - an Excel document with various sheets: Session Details, Metrics, Sortable Clips, Sortable Annotations, Clips by Task + Participant, Annotations by Task+Participant. Perfect for those who need quick feedback and want and easy way to view and create videos of users. UserTesting.com allows our small team to accomplish more more research at a lower cost and LOE than we would otherwise be able to achieve. It has dramatically changed the way we collect data. "I talk to more users now than ever!" I love how easy it is to create and set up a usability study to get valuable information quickly and easily for my projects. I have been working with the tool for a while, and love the new features that come out to make my job easier (like the new bookmarking feature). I don't love the Excel export, and would like to see it be a bit more robust so that I can more easily export informaiton. I'd also like a better tagging solution so that I can tag things with commonly used parts of our website and then more easily add to overall insights on that area. I'm solving eCommerce-related problems - what does the customer want? how does this work for the customer? what usability issues is the customer coming across on our site? Through using UserTesting.com, I've been able to gather feedback and data to support decisions that are being made to help make my website better. The ease of constructing and implementing online research tests is exceptional and feedback happens the same day. As feedback flies in customizing or reshaping the test further is simple to achieve. Further, professional and friendly staff support is quick to assist and always has helpful answers to questions. I have no dislikes with User Testing... Only great appreciation and high respect! Give User Testing a trial run.... Chances are you will become addicted to the ease and great access to the market feedback on your web content that you will experience. Website feedback and Internet search profiling are the two uses that I have found most beneficial. My web sites are better because I can identify weaknesses early and I enjoy the ability to follow-up with respondents through an anonymous messaging system, when useful. Further, the testers themselves are generally thoughtful and offer insightful feedback... They seem to really enjoy their experience as partners with the User Tedting platform. "A View From Both Sides"
User Testing is one of the BEST ways to garner genuine user feedback. UserTesting provides pools of demographically segmented users for you and your company to test with. The User Testing pools of demographics are based off self-reported data, and a rating system. If the tester is not honest, they're able to take your surveys, and can skew your results. I've run some tests where users have had inappropriate tabs up in the background. Trying to convince the c-suite or even executive levels of the capability of your designs is difficult enough - but with UserTesting, you're able to PROVE the performance of your designs. I love how easy UserTesting makes it to recruit and test. Time to recruit and test is usually under an hour; this makes it easy for me to make changes and test again! Panel is thoughtful and great at speaking aloud. The pricing is too high for small startups that don't run that many tests. Great if you run a LOT of tests. Expensive otherwise. I've recruited mostly for a general panel - likely would be hard to get specialized participants. Needs analysis, usability testing. The tests we ran identified key adoption issues. Can't do card sorting without incurring additional costs. Also, sometimes you get a bad user who rushes through the tasks and/or doesn't give much feedback. Thank you for your feedback! We love seeing our customers become fans! And every one of us strives to make your experience with our human insights platform fast, effective, easy and enjoyable. Remember, in the rare instance you get a panel tester who 'rushes through', we're more than happy to credit you for that tester's response. Cheers! "Effective, efficient, targeted way to gain user insights"
Its amazing how quickly I can launch a test and get feedback. If I am willing to wait, I can even get very specific user profiles that would otherwise be difficult to obtain. There are times when I want to get an extremely specific group that can be very difficult to find with this tool. There are also a lot of product features that I would love to see roll out that do not currently exist but it still gets the job done. My biggest complain is there new pricing plan - made the conversation with my stakeholders difficult. We test early and often. Everything from concepts, to prototypes, to production benchmarking. We are able to catch bugs, gain user insights, prioritize features, and gauge ROI. It is easy to generate efficient tests without recruiting users on my own. It allows me to spend more time conducting analysis as opposed to physically be there and moderate the tests. I also like the bookmark feature where I can create highlight reels for my test. I don't like how easy it is for a user to get lost in the process of taking the test. Sometimes I have to create test scripts and put them on Usertesting and they are not 100% conversational. It is also difficult to guide users to complete your test without putting bias information in the test script. I highly recommend it however, there is a human aspect to testing that is lost in translation. Usability amongst the different products and prototypes. Moving buttons, placement of certain UI widgets, and valuable feedback on verbiage choices. * We monitor all UserTesting reviews to prevent fraudulent reviews and keep review quality high. We do not post reviews by company employees or direct competitors. Validated reviews require the user to submit a screenshot of the product containing their user ID, in order to verify a user is an actual user of the product. Hi there! Are you looking to implement a solution like UserTesting?